A few days after I discovered (to my enormous glee) that yo-yos were all the thing in the 1790s, I happened upon an article in the Boston Museum of Fine Arts magazine MFA Preview. There’s a very fine exhibit of the work of Spanish artist Francisco Goya on display there right now, but what really grabbed me was a reproduction of a sketch he made some time in the mid 1820s that’s part of the exhibit—I don’t have permission to reproduce it here, but you can see it in the exhibit preview slideshow on the Museum of Fine Arts website. The sketch was made sometime between 1824 and 1828, when Goya was living in Paris, and is entitled “Locos Patines”... or “Crazy Skates”—and it shows a rather alarmed gentleman wearing roller skates. Yes, roller skates—and if you look carefully at the background, you’ll see someone riding a hobby-horse, the precursor of the bicycle. So of course I had to look into the history of roller skates, which actually date back to the mid-18th century and were first seen either on the London stage in 1743 (presumably in a dance number! ), or in the Netherlands at some point in mid-century on the feet of an anonymous gentleman who wished to go ice skating in the summer, depending on whom you ask. A John Joseph Merlin seems to have been making an early form of in-line skates in England in 1760, and the first patented skates appeared in France in 1819, also with an in-line wheel configuration (which makes sense, if you consider that people were indeed trying to ice-skate without ice.) 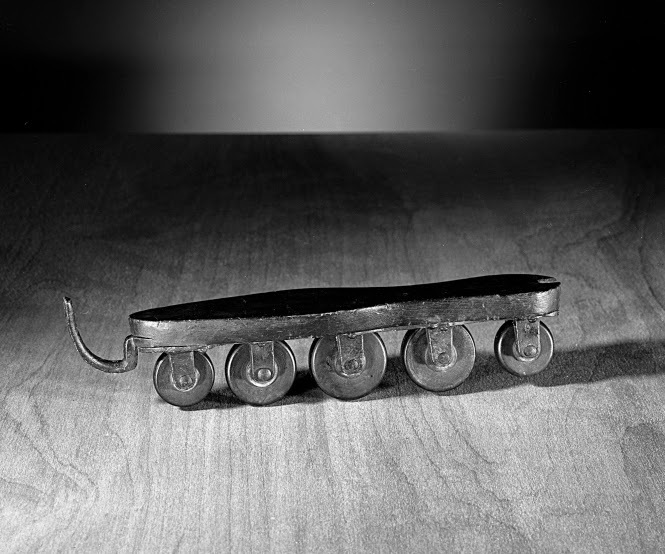 An English patent followed in 1823 for the Volito, another in-line skate design, with wheels in graduated sizes which enabled easier turning (that's it, above right.) By the late 1850s, public roller skating rinks were opening in London. Curiously, all the internet sources I researched state that skates with four wheels situated two on either side of the foot weren’t invented until the 1860s in New York...but there in the Goya sketch in the 1820s we have skates with just that configuration. I have the feeling there was a great deal of experimentation going on with their design...but who knew that roller skating was another popular 19th century pastime!